Martin Puryear's "Big Bling" sculpture at Madison Square Park in New York. Next time you're passing along Kelly Drive and you happen to catch a glance at Carl Milles’ “Playing Angels” sculpture, don't let your peripheral vision (because you're obviously watching the road) fool you. There's going to be another giant sculpture visible on the riverside in the coming weeks. 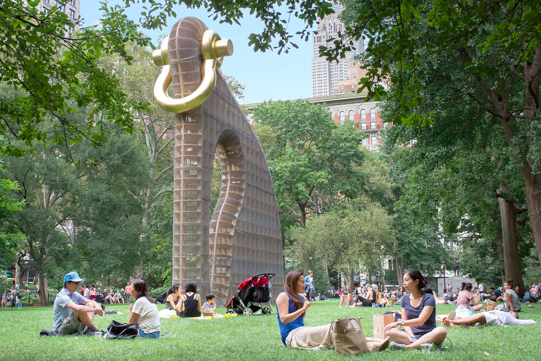 The Association for Public Art (aPA) announced Tuesday that Martin Puryear's internationally acclaimed "Big Bling" sculpture, currently residing in New York's Madison Square, will be installed between Fountain Green Drive and the Connecting Railway and Girard Avenue Bridges. The 40-foot-high sculpture will join a group of noteworthy Kelly Drive sculptures, including Edward C. Potter’s "General Ulysses S. Grant" and Frederic Remington’s "Cowboy," through November 2017. "Big Bling" is sort of a challenge to describe. It looks like it could be a person bent in prayer, a harp, an elephant, or a rotated nose with a septum ring, to these eyes. The multi-tiered wood structure, Puryear's largest outdoor sculpture to date, is wrapped in chain-link fence and anchored with a gold-leafed shackle. Its abstract form is made of laminated timbers and plywood. Commissioned by Madison Square Park Conservancy's contemporary art program, "Big Bling" debuted in New York in 2016. “Installing Big Bling within an expanse between Kelly Drive and the Schuylkill River will offer a totally different setting from Madison Square Park,” said aPA executive director and chief curator Penny Balkin Bach. “It will provide an opportunity to see the sculpture in a very different context along the riverfront with the Pennsylvania Railroad, Connecting Railway Bridge in the background." A free public celebration welcoming Big Bling to Philadelphia will be held Thursday, June 8, 2017 from 4:30 p.m. to 7 p.m. You can register to attend the event here.